Ceramic Arts — Clay, Food and More…. Every year I’m part of an Artists Open-Studio event. 8 Studios (22 Artists) — Opening our studios in the Lake Minnetonka Area. First weekend in May — Actually, April 30th – May 1st! 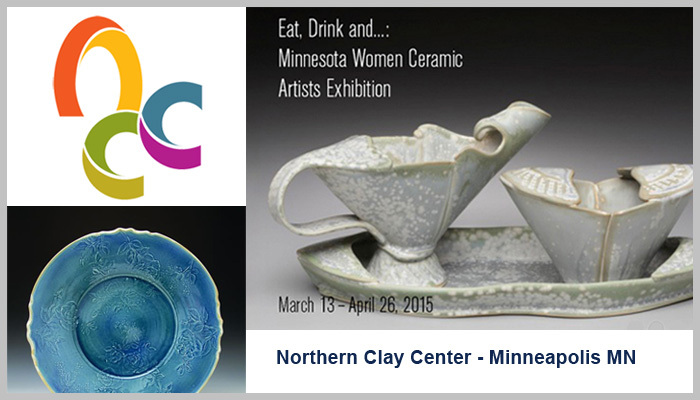 I’m thrilled to be part of a Tableware/Dinnerware Show at NCC in Minneapolis! 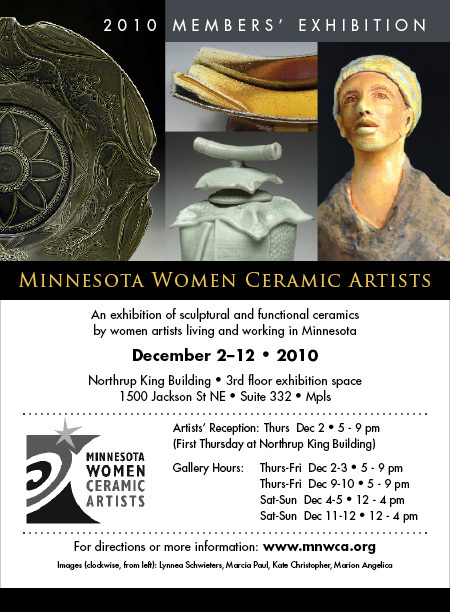 Sponsored by MNWCA – Minnesota Women Ceramic Artists. Opening Reception — March 13th. Show — March through April. I’m hosting my very first Holiday Sale, along with my pottery neighbor, Donna Winberg, at my Home Studio in Deephaven! Thanksgiving Weekend. Wonderful Guest Artists. Every year I’m part of an Artists Open Studio event. This year, we’ve changed the name a bit — But we’re still 22 excellent Artists — Opening our studios in the Lake Minnetonka Area. This Weekend — First weekend in May! 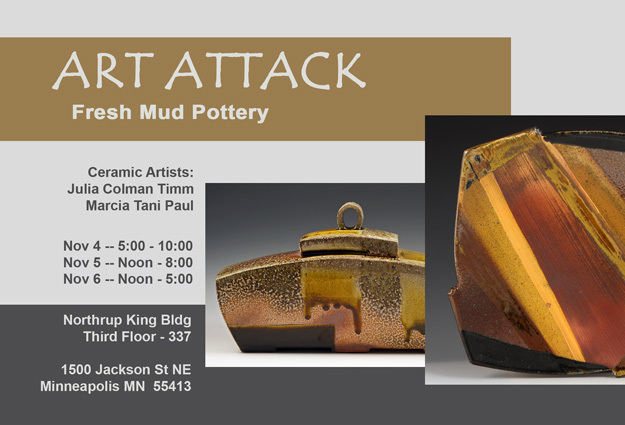 Once again, it’s time for Art Attack at Northrup King Building, in northeast Minneapolis — The annual, always fun, NKB studio crawl — ART ATTACK – 2011. 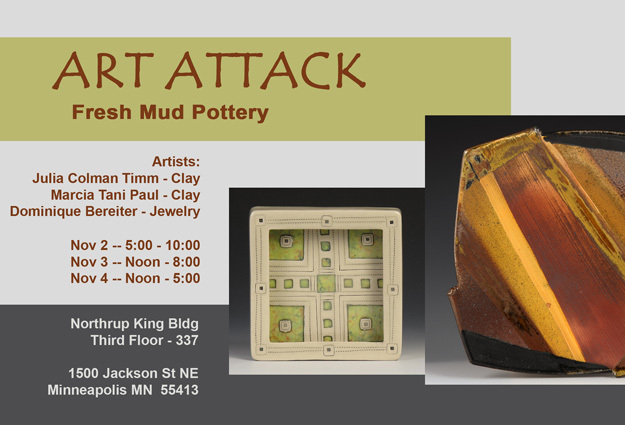 If you’re in the Twin Cities, hope you can stop by — Fresh Mud Studio – Suite #337. In my ‘other’ studio at Northrup King Building. A full weekend of Northeast Minneapolis annual arts crawl — ART-A-WHIRL-2012. If you’re in the Twin Cities, hope you can stop by — Julie and I would love to see you! Fresh Mud Studio – Suite #337. Artist Studio Tour: I live/work in an ‘art-inspired’ house near Lake Minnetonka, just west of the Twin Cities. 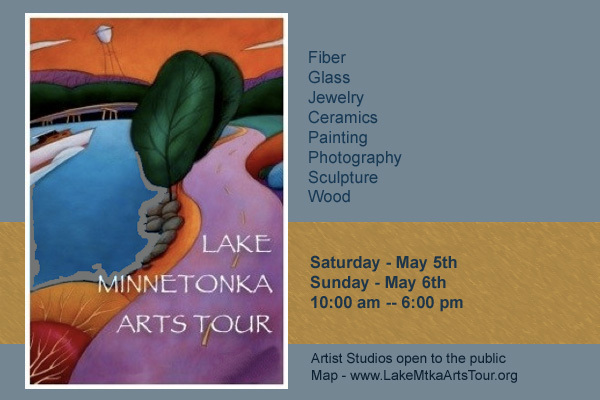 Once again, I will be participating in the seventh annual Lake Minnetonka Arts Tour — The first weekend of May: Saturday, May 5th and Sunday, May 6th. Twenty-Six Artists opening their studios around the Lake (with a total of 50 Artists participating). I’ve just moved into a new studio at Northrup King Building, in northeast Minneapolis. And this first weekend of November is an annual NKB arts crawl — ART ATTACK – 2011. Artist Studio Tour: I live/work in an ‘art-inspired’ house near Lake Minnetonka, just west of the Twin Cities. Once again, I will be participating in the sixth annual Lake Minnetonka Arts Tour — The first weekend of May: Saturday, April 30th and Sunday, May 1st. Twenty-Six Artists opening their studios around the Lake (with a total of 50 Artists participating). That’s ‘Minnesota Women Ceramic Artists’ – A great group for networking, connecting, growing, sharing anything ceramic. And we’re busy getting ready for a great Show of our Members’ work!! 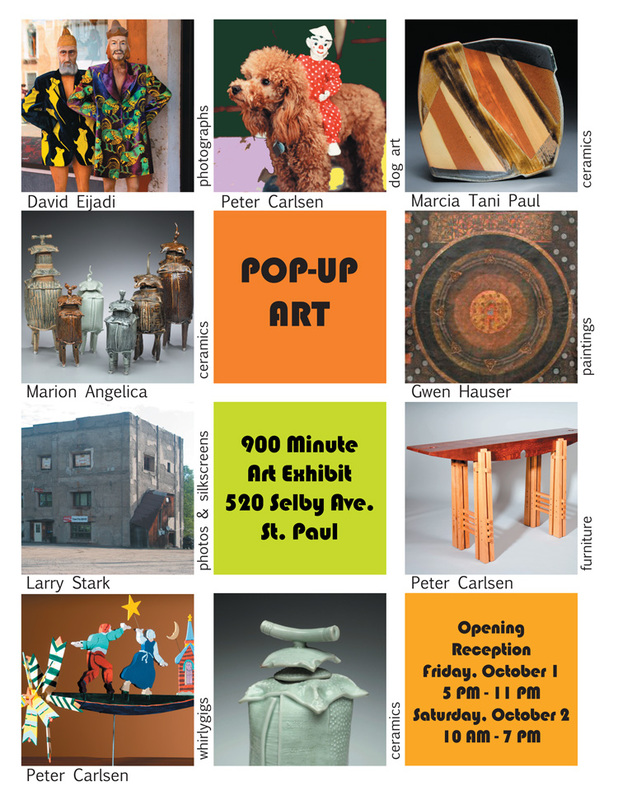 Exhibition held at Northrup King Building in Northeast Minneapolis. Show runs for next two weekends — Hope you can stop by! I’m participating in a Gallery Show in St. Paul — Friday, October 1st and Saturday, October 2nd. 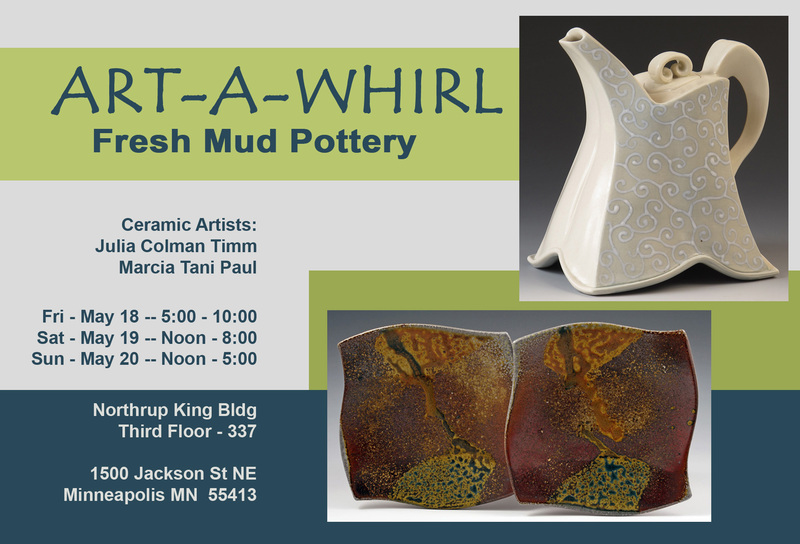 I’m excited to be showing my work along with ceramic artist (and good friend), Marion Angelica!! The location is 520 Selby Avenue, St. Paul — The Office/Gallery of Architects, Peter Carlsen and Sylvia Frank. The Show is Friday and Saturday only – That’s 900 minutes of FUN and ART!! Artist Studio Tour: I live/work in an ‘art-inspired’ house near Lake Minnetonka, just west of the Twin Cities. 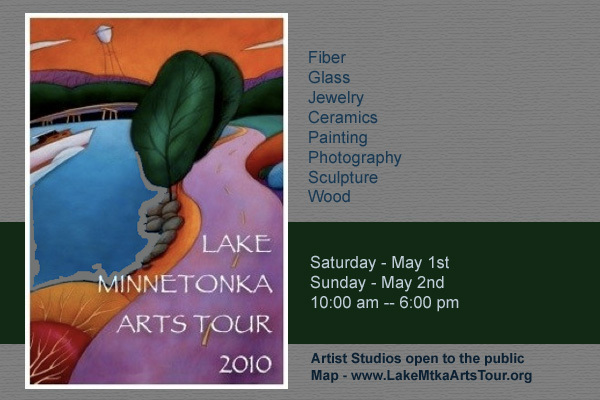 I will be participating in the fifth annual Lake Minnetonka Arts Tour — The first weekend of May: Saturday, May 1st and Sunday, May 2nd. Nearly thirty Artists opening their studios around the Lake. Pottery Pottery Pottery: The following weekend (the second weekend of May) is the St. Croix Pottery Tour, just north of the Twin Cities. So many potters; so much pottery!! I’ll be helping (as worker-bee) at Studio of Guillermo Cuellar. Gallery Show: I’m very excited about a Show at Mill District Arts Gallery in downtown Minneapolis (near the new Guthrie Theatre).